Most of our famed Deal Alerts tend to be for commercial products, but this one is a bit unique. Udacity, a provider of so-called "Nanodegree" certificates in computer science subjects, is offering discounts for certificates in Android development in the next two days. So if you've always wanted to work in application development, and if you think you can handle the workload that such an education will provide, you can get 50% off your first two monthly tuition payments if you sign up by tomorrow. The two programs for Android development, the Android Basics Nanodegree and Android Developer Nanodegree, were both co-created by Google. The basics course is a 6-month certificate, and the more advanced intermediate course should take 9 months. Tuition runs $200 a month, so a 50% discount on the first two months should save you $200, which isn't bad. Over the course of each certificate that works out to a savings of 11-16%. And, presumably, once you have your certificate you'll be able to do some level of Android software development. There are a few other Nanodegrees available in areas like web development, VR, and a fast-track option for Android Development that only takes four months. While education may be its own reward, keep in mind that you can also make a good bit of cash programming. If you are interested, just be sure to take into account the course requirements before you spend any money. Some of the programs at Udacity expect an extra degree of subject knowledge or prerequisite education when going in. 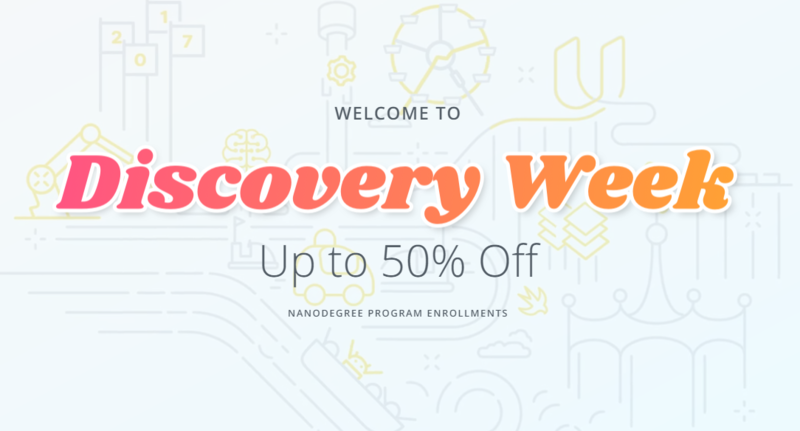 You can check out the full details for the courses and discounts available during Udacity's "Discovery Week" over here. They cover a wide variety of subjects, so whatever your development interests, there's likely to be something to satisfy you.